If you’ve already judged Mortal Kombat vs. DC Universe based solely on the fact that it’s a Mortal Kombat title -- or that it isn’t technically as rich or deep as other fighters -- the game (and this review) is not for you. There’s no way you could compare the game on any technical or competitive level to any number of Capcom vs. [Marvel/Care Bears/Whatever] or SNK fighters; if you do, you’re missing the point. MK vs. DCU certainly seems to be meant for a more casual fighting audience, with a focus on two important points – ease of play and ridiculous, frivolous fun. So before you click any further, I have to ask that if you fall into that camp -- and that's fine, I understand -- don't even bother clicking through and reading the review. This is not for you. Here is a Tatsunoku vs. Capcom trailer; please enjoy it. Save the energy you would have used to comment on this review for the inevitable bitching about how Capcom screwed up the Street Fighter II HD remake because Ryu has an extra pixel on his toe. For everyone else, hit the jump. The game’s explanation for this unlikely mash-up is preposterous, and delivered by an in-game Story Mode that’s both absurd and brilliant in its presentation. Comic scribes Jimmy Palmiotti and Justin Gray must have thought long and hard on this one, with a battle between Superman and Darkseid triggering some kind of inter-dimensional world collision, bringing both universes together. (It involves a portal, Superman’s heat vision, if you must know.) Confused, characters from both universes began to question one another’s motives, which leads to, er, kombat. To make matters worse, both sides are being possessed by “Rage,” which makes them act like a belligerent, drunken frat boy, ready to pointlessly pummel things at a moments notice. But when you step back and look at what you’re watching -- conversations between Batman and Sub-Zero, for Christ’s sake -- it’s hard not to feel a tinge of giddiness, particularly if you’re a longtime fan of either universe. Presentation-wise, it’s an incredibly smooth experience, with cut-scenes and dialogue transitioning seamlessly into fights. It’s easy to hope Midway knew what they were doing here, going for a b-movie campiness that’s just as fun as it is face-palm-inducing. Whether intentional or not, if you go into it with a sense of humor and checked expectations, you’ll find it difficult not be amused. Depending on your level of dedication, each story mode can be finished in one sitting, lasting somewhere around three hours a piece. For the most part, the AI is a complete push-over in the Story Mode, and other than the final boss who (in typical Mortal Kombat fashion) unfairly inflicts far more damage per attack than he takes, even casual gamers shouldn’t have a problem here. Completing both sides will unlock two playable characters (Shao Kahn and Darkseid), but there’s no real reason to return once you’ve seen it through to the end. The game also features a basic Arcade mode where you can select one of the game’s 20 main combatants, going from battle to battle until you reach each your character of choice’s specific ending. Unfortunately, it’s almost not worth it, as each ending is a simple flat storyboard and nothing more. 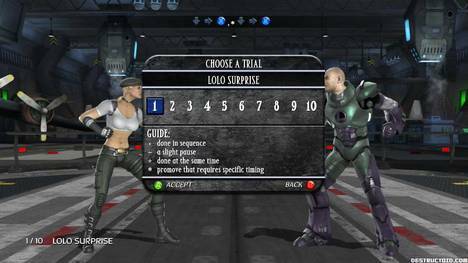 The game also features “Kombo Challenges” for each character, in which the game presents ten advanced combos, tasking the player to complete them. For most, this will be an incredibly frustrating endeavor; many of the combos require very specific timing and character positioning. Since the game doesn’t give you an example of the combo in action, you have absolutely no way if you’re doing it properly, or even on the right track. Gameplay-wise, MK vs. DCU is a step up from previous MK 3D fighters in that it feels smooth, fast, and fun. There’s nothing particularly deep about the gameplay, which is mostly based on special moves and canned combos, but there’s almost no barrier to entry due to its pick-up-and-play nature. It also looks damned cool in action, with flashy moves that are simple to pull off, and will make you feel like an expert within minutes of grabbing the controller. New to the series is the quicktime-event-like gameplay, "Klose Kombat," which is a special grab move that triggers the camera to zoom in on the action. By pressing any of the face buttons, you’ll perform brutal, up-close attacks; opponents can reserve said moves by anticipating and matching button presses. It’s gimmicky and there’s not much to it -- it comes down to being psychic or lucky, really -- but is a fun addition that looks cool enough that it never really gets old or too irritating. Then there’s “Rage,” which you essentially build up by losing the match. Once your “Rage” meter is full, you can invoke the power, making your character squat like they’re about to drop a deuce, and all most of your opponents attacks will be reversed, making you mostly unstoppable. It’s an interesting mechanic, but a bit unbalanced. For one, most moves in the game can be avoided by simply squatting down and blocking; on more than one occasion you’ll find that just doing so and waiting out the “Rage” will keep you safe from any hard. On the other hand, awarding a player for losing by making them “invincible” seems a bit odd. Or course, this being a T-Rated Mortal Kombat game, it lacks the violence and brutality fans have come to expect from the series. Admittedly, some of the finishing moves are lame – you simply can’t compare Sub-Zero’s spine-rip to this game’s relatively tame ice-shattering. But the game is far from being squeaky clean, with plenty of blood splatters and some pretty cool looking facial bruising (and clothes tearing) as matches progress. 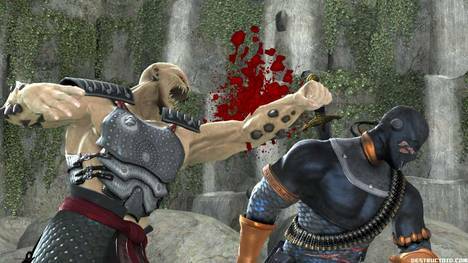 If you’re playing Mortal Kombat for the six or so seconds of gore and dismemberment that follows a match, you’re likely to be disappointed, but the lack of them doesn’t ruin the core experience. While Mortal Kombat vs. DC Universe certainly won’t be played competitively by fighting game professionals and enthusiasts, no one can accuse Midway of making a game that isn’t fun. It contains its fair share of flaws, not the least of which are some gameplay unbalances and curious lack of interesting unlockable content. But if you’re looking for silly, lighthearted fun to kill a few hours with friends over a few laughs, you could certainly do a lot worse than Mortal Kombat vs. DC Universe.